Villa Seascape is a stunning home on the ocean’s edge that is set to raise the bar for contemporary tropical living in Lembongan. 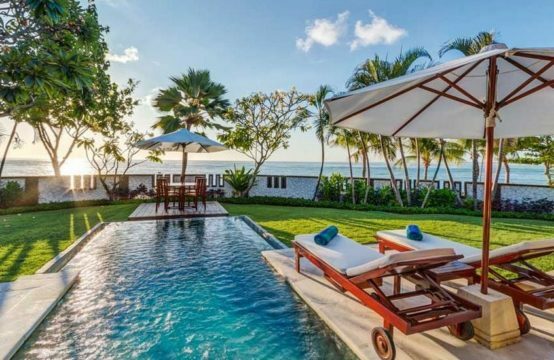 Seascape is the perfect name for this spectacular villa, which offers expansive ocean vistas from its prime beachfront position. Bali-based Italian architect Valentina Audrito shaped the ultra-modern design with her signature playful use of space, soaring ceilings and creative blend of natural and fabricated material. The result is a laid-back-beach-house-meets-luxury-loft-living vibe that encourages guests to kick off their Jimmy Choos in favour of uber-cool (but uncompromisingly comfortable) barefoot bliss. The maxi-minimalist design aesthetic is perfectly pitched, with a beach-chic colour palette of neutrals and aquas, and a circular theme softening the rectangular shapes, from decorative alcoves to bathroom mirrors to the pool terrace. All the rooms are adorned with natural materials — polished pebble and teakwood floors, terrazzo walls and bathtubs, bamboo screens, seagrass rugs, custom-designed furniture using plaited rope and rattan, and shells decorating woven baskets, curtain tie-backs and wooden bowls. Among the contemporary luxuries are sublimely comfortable King Koil beds, crisp cotton bed-linen, 52-inch TVs, NID music system, Bose speakers and home cinema. And attention to the smallest detail is evident in thoughtful extras such as beach bags in the bedrooms and Sensatia toiletries in the bathroom. Cooled by ceiling fans and the sea breeze, Villa Seascape’s soaring double-height living room is the villa’s social heart. This impressive split-level space is designed with easy entertaining in mind. Glass doors fold back fully onto a double-height terrace where a dining table comfortably seating ten commands pool and ocean views. Within, clusters of contemporary modular sofas and woven rattan ottomans invite both sparkling conversation and quiet repose. The beautifully designed kitchen, with distinctive wedge-shaped island counter is slightly elevated and lightly screened behind columns of distinctive ceramic lamps. While it gives guests the convenience of a fridge, hob and coffee machine, the chef prepares meals in the staff kitchen behind the main villa building. Accessed from the aerial walkway above the living area is a netting-floored mezzanine suspended like a huge hammock above the guest kitchen. This is the perfect spot for kids (and adventurous adults) to curl up on a pile of cushions and enjoy a good book or movie (there’s a wall-mounted 52-inch TV with satellite channels and DVD player at one end), while keeping an eye on activities in the living area below. This stunningly designed poolside space spills out beyond the dining terrace towards the spectacular 15-metre swimming pool. On one side, over-sized beanbags rest on the pebble-stone deck in front of a cushioned bench built into a gracefully curved coral wall. Across the pool is the pool bar where an elongated island of polished concrete and aqua-coloured timber stretches out under a sail awning, providing an outdoor kitchen and a sit-up bar counter for alfresco meals. Inches away from the beach, semi-circular polished concrete seating curves around a fire-pit — the perfect place for sunset cocktails and after-dinner star-gazing. The luxurious Villa Seascape media room has been designed to effortlessly transform into a stunning ocean-view fifth bedroom. Location: Nusa Lembongan, Bali, Indonesia. 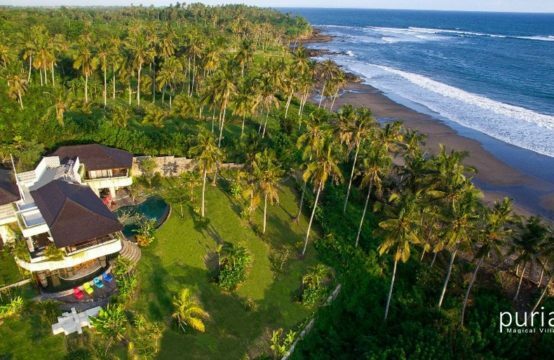 Villa Seascape Capacity: 11 people (5 ensuite air-conditioned bedrooms: 3 with king beds; 1 with 3 single beds, 2 of which can be converted to a king bed; and a media room with 3-metre round mattress which can be set up as the fifth bedroom). Living Areas: Double-height fan-cooled living area; media room; dining terrace with table for 10; poolside entertainment terrace/bar. 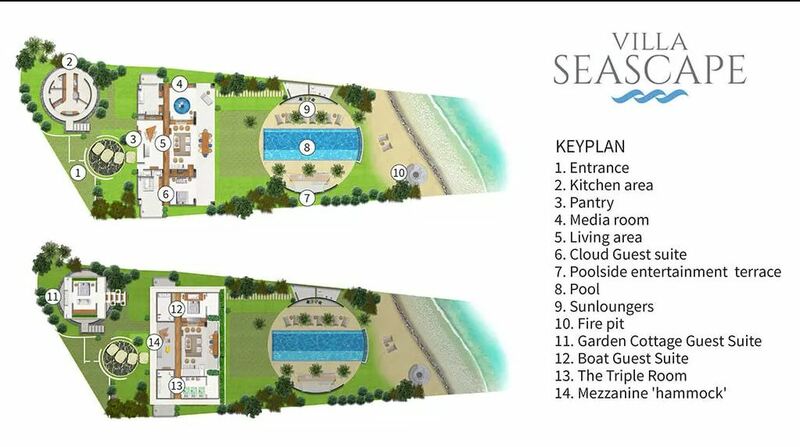 Pool: 15m x 5m (including a 1.8m wide shallow children’s wading area running the full length of the pool). Depth between 1.2 and 1.5m. Staff: Villa manager; private chef; butler; housekeeping; gardener; maintenance and security. Entertainment: Home theatre system in media room with 260cm x 105cm retractable projector screen with internet connection and extensive digital movie library; two-zone NID music system with Bose speakers in the living room and the pool bar; 52-inch satellite TV and DVD player in the mezzanine; 52-inch satellite TV and DVD player in the master suite. iPod dock in living room. Communication: WiFi internet access; printer available for guest use. 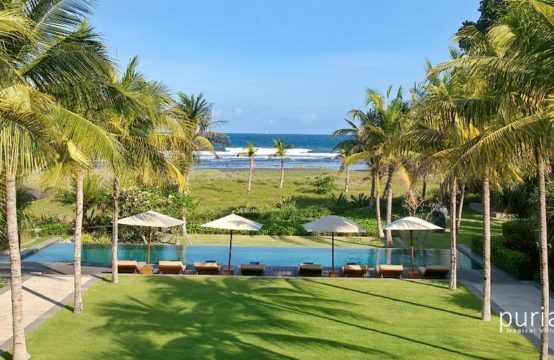 For families: Villa Seascape is an idyllic choice for families. A high chair is available in-villa and other kids’ equipment can be hired for a small additional charge. Spa: In-villa massage can be arranged on request, using visiting therapists (extra cost applies). Transportation: Villa guests arrive via the Sanur-to-Nusa Lembongan ferries which run regularly through the day. Guests arriving in Sanur later than 5pm will require overnight accommodation on mainland Bali as crossings are not recommended at night. Your villa manager can help with ferry bookings (on guest account). Once on-island, a pick-up truck (seats 10 passengers) and driver can be arranged. The villa staff can also arrange motorcycle, buggy or bicycle rental for guests. Additional Facilities: Wine fridge; gas barbecue; safety deposit boxes in each bedroom; Aero water filtration system; full back-up diesel powered generator.